November 3 is National Sandwich Day, as opposed to National Sandwich Month which is the Month of August. According to Gone-ta-pott.com this is a day to honor and enjoy sandwiches. A sandwich is defined as a food item made of two or more slices of leavened bread with one or more layers of filling, typically meat or cheese, with the addition sometimes of vegetables or salad. Sometimes mustard, mayonnaise, or butter is used. I've posted may recipes for Chocolate Panini and Grilled Chocolate Cheese Sandwiches and the like, but I love this recipe that appeared in 2009 in the Recchiuti Chocolate newsletter. Michael has a dynamite Recipe for Brioche and Chocolate Mayo BLT. I love bacon and chocolate, and this is a subtle pairing. There's a Recipe for brioche that looks fairly easy, but if you can't wait, go out and buy a nice artisan brioche to use in this special BLT. At the Cheese & Chocolate Taste Project, Recchiuti assembled his BLTs with his homemade brioche, applewood smoked bacon, sharp cheddar cheese, fresh butter lettuce, a thick slice of heirloom tomato and this great Chocolat-y mayonnaise. Place yolks in a stainless steel mixing bowl. Combine unsweetened chocolate and olive oil in double boiler and heat mixture to 115°F. Begin beating egg yolks on medium speed for 1 minute, then increase speed to high and whip until doubled in volume. Reduce speed to medium and add chocolate mixture to the yolks carefully, in fine stream. The yolks will start to emulsify and thicken. If mixture becomes too thick you may add a small amount of oil to loosen the mixture. Season to taste. Note: This mayonnaise is meant for immediate use and will not keep well in the refrigerator. 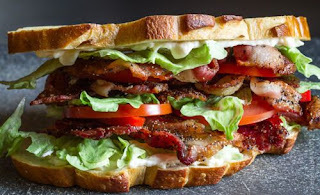 Celebrate the day with this fabulous BLT!